After a long drive of 1900km and a ferry for 8 hours, the team finally arrived at Alastaro circuit on Thursday. The weather was great and we spend the day with preparing the car for the second FiA round of the season. Here in Finland it' is always a little bit strange in the evening, you are waiting for the night and darkness to come, but it doesn't. On Friday it was raining until noon, after drying the track the races started. But due to several major clean-up jobs it was not possible to finish the program before the 8 o'clock curfew. So there was no qualifying session for us that day. 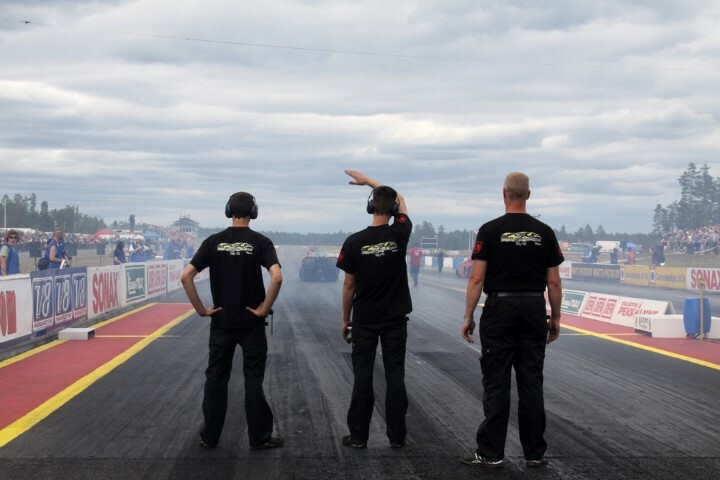 On Saturday the sun was out and for our first race we were paired up against Jarmo Kuutniemi in the right lane. All classes seemed to have some problems in that lane. Danny couldn't stay in his line and got off the throttle about halftrack. Our second qualifying session in the left lane was much better. Danny made a good start, drove through tire shake and finished in a time of 5,77 sec. Again a new Personal Best and second qualifyer!! On elimination-day we lined up next to Leif Andréasson. Danny lost traction after the start and tried to get the car down the slippery track. He couldn't hold it and hit a reflector at about 1000ft. Leif took the win with a 5,77 sec. Unfortunately our new body had suffered some damage that needs to be repaired before the next race. After this second race it is clear that everything is working out just fine. Again a new Personal Best of 5,77 sec. and still the fastest Top Methanol Funny Car in Europe. These great improvements are something to be proud about!